DUTCH Translation by René - http://www.goto2012.nl - THANK YOU RENE'! The plane glides through cotton candy pink clouds at sunset. It reminded me of the sun rises our group had at Puerto Morelos. I was on my way home once again from our Mundo Maya Unplugged Pilgrimage to Tikal, Guatemala. I didn't know what to think about this. Was I going home… or leaving home? I didn't know if I was coming or going. I didn't know what to feel about this . . . I didn't know anything at all. I was a void, an empty canvas in which to put something into. Over the last 19 years, I have returned to the Maya lands to reclaim pieces of my history, ancestry, and even pieces of my soul. But this trip was quite different. It was silent. Tikal was silent and still, like it was waiting for something to happen. "The calm before the storm?" I wondered. Our journey took place between two powerful eclipses and split in half by a spring equinox. To top it off, Mercury was retrograde the entire trip. Our impeccable and unwavering group were purified over, and over, and over again. Yep! We got cooked. The trip was filled with synchronicity and perfection, and yet I felt like I wasn't even there. It was almost like I had lost my inner compass. I couldn't tell if I was in this world or the next one. I felt like I was in a cocoon separate from everything, yet connected to everything. We cleared and nurtured ourselves in azul oceans and crystal clear sacred Maya cenotes. We took part in a purification ceremony with a Yucatán Maya priest in a sacred closed cenote cave, filled with Copal smoke and flickering candles. He called in the past, present and future, his ancestors, the Balams, and the sacred sites with this ancient Maya language. When we looked in his eyes, we could see the echoes of his ancestors there. We were initiated into sacred ways by Kaqchikel Maya from Antigua on equinox in the Grand Plaza of Tikal. Yet another example of magic that happens in these places. You can't plan this kind of perfection. We wandered through Tikal and Uaxchactun and felt the sites. The group began to recognize that we were in fact in a cocoon. Was it a cocoon between eclipses, or Mercury being retrograde? Or was this the final transformation before we enter the 5th world? We forgot about our homes, families and our lives. It was almost like they didn't exist anymore. All we had were the temples in front of us, the heat, and the monkey's howl, and the parrot's squawk. I watched . . . Each member of our group, if they knew it or not, was being called to stand in their own true power. Each person was called to do their destiny's part which was in the grand scheme of things. Many were called to help release souls from stones; others sent love. We were cleaning house in preparation for something we did not understand. 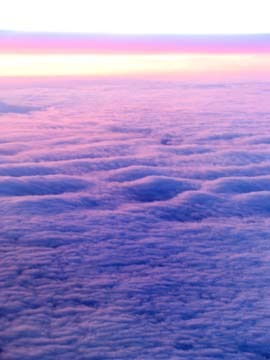 So here I am, 30,000 feet above the earth, passing through the pink sunset clouds. I can feel the love of the earth rising up to meet me. I can feel the love of the sky passing through me. Finally, I receive a message which I had waited over a week for. The ancient ones speak . . . Your work is almost complete. You have set your ancestors free. You have also set yourselves free. You have readied the temples for new frequencies. You are now in that space between in which to create a new world for yourselves. No guides, angels or guardians will tell you how to create this world. It is time to stand in your own creative power and manifest the fifth world together. There are no more messages for you in the fourth world. All that needed to be transmitted in the fourth world has been received. The past will not and cannot offer you anything useful at this time. Don't look back and don't look outside yourself. The truth is not out there . . . it is in you. Look forward inside yourself for you are your own ancestors returned to set yourselves free of the limitations of the fourth world. You have begun to unplug yourselves. You are now ready to prepare for the fifth world that is just ahead of you. You are being unplugged from this world. To move forward, you must unplug. This is a time between time; A time for you to prepare. It is now time tat you meet the Counsel of the Fifth World. We are those who came from the future to anchor keys and doorways to the fifth world. We have left messages for you in sacred sites in the Americas: Palenque, Tikal, Copan and Quirigua are some of the places we have done this. But many sites are still shrouded in jungle . . . yet to be discovered. It doesn't matter if the sites are discovered. The seals to the fifth world have been broken free. This is an amazing time for you all. During the next week, the ancient ones shared some other things with me. They said that while we are unplugged from the fourth world, and have yet to enter the fifth world, we might feel like we have lost our inner compass. It might feel like were are walking through a dream. It will be hard to tell if we are in the fourth world or the fifth. We might feel like we are just going through the motions of life and not really being present or connecting anywhere. The things we feel, think, or want to do might not make practical sense. They also shared some concerns they have about our physical bodies. They say the physical body is heavily programmed with the fourth world energies. When you unplug, your body may begin to feel like it is not supported by the fourth world. This is actually very true. The ancient council suggested that it is very important to talk to your body to let it know that it will not die. Remind your body that it is just transforming into something better that it does not understand at this time. If you don't talk to your body, it is possible to manifest issues that are related to lack of support. You might experience your knees and hips going out. Also you might see issues with lungs, like asthma or bronchitis. Tell your body not to fear. When I titled our trip Mundo Maya Unplugged over a year ago, I had no idea what the Star Elders meant by this. I thought being unplugged meant going into the jungle and getting away from modern civilization. Now I realize that being unplugged means moving past the linear 3-D, fourth world we are residing in now. How appropriate that the rest of the message came to me at Easter time; a time where many of us think of death and rebirth. It feels like this is what we are actually doing in this amazing age. As I end this writing, the Star Elders popped in and remind me to tell you . . . expect the unexpected . . . and dream an amazing dream . . . for these are the days you have been waiting for. Some of YOUR responses that came in . . .
*** Aluna Responds.... YES.... it is OK to feel these things. You can't change the way you feel can you now? BUT make sure you hang out until the BIG PARTY! Thank you for your last newsletter. I just want to share that I recognize myself in the message of the ancient ones. Being unplugged and being in between the 4-th and 5-th, as you write it: During the next week, the ancient ones shared some other things with me. They said that while we are unplugged from the fourth world, and have yet to enter the fifth world, we might feel like we have lost our inner compass. It might feel like we are walking through a dream. It will be hard to tell if we are in the fourth world or the fifth. We might feel like we are just going through the motions of life and not really being present or connecting anywhere. The things we feel, think, or want to do might not make practical sense. Also that we have to use our own creativity for the new world.... I recognize that message.... Thanks, it is a support to read this. It is very hard however to make the right decisions. I've got such a strong feeling to make a big change in my life, like emigrating to south/middle america....... But it is hard though to feel if it is really the right thing. Hope that as time passes by, my vision and feelings will become clearer.... Love and light, Nistal.